Experimental & Design Bureau "Zvezda"
Despite the fact that the conception of the wing missile design and mission was formulated before World War I, only military operations during World War II between 1939 and 1945 showed the necessity of jets and tactical wing missiles. In 1955 the plant received the government order on development of "air-to-air" missile systems. Specialists of the enterprise began development of the missiles. 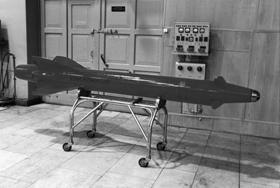 In 1956 the enterprise mastered serial production of the first Soviet guided "air-to-air" missile RS-1-U. It was developed by a famous designer, Dmitry L. Tomashevich, in Experimental & Design Bureau-2 and intended to equip fighters MiG-17PFU and Yak-25P. The works on guided missiles' development were expanded and on May 17, 1957 under decree of the Ministry of the Aircraft Industry a design bureau was founded on the premises of a serial design department at the plant #455. It was headed by Michael E. Edidovich, who had worked as a chief technologist of the enterprise before. The staff of the design bureau began developing "air-to-air" missile R-55 to equip Su-9, Su-15 fighters as well as one of MiG-21 modifications. After RS-1-U missile testing and its putting into service with the air forces of the Soviet Army, the enterprise began developing more perfect models of RS-2-U and RS-2-US. They were guided onto the target along the line, formed by a scanning ray of fighter-interceptor radar. A new "air-to-air" missile R-55, derived from RS-2-US and designed to equip MiG-21, Su-9 and Su-15 fighters was developed and serially produced. It was outfitted with an IR homer, which had enhanced jamming immunity that provided efficient missile operation at the altitude of up to 22 km and air target interception at the distance from 1,2 km and up to 10 km. In 1963 the first tests on RS-2-US missile application onto the ground targets were carried out. According to the statement #50 "The RS-2-US missile launches onto the ground targets are possible but pointless because of insufficient precision of missile's hit with its small warhead". Besides, in 1965 the Soviet government received an inquiry from Vietnam on "air-to-surface" missile development and supply. Engineering designs on its development were drawn up together with Mikoyan Experimental & Design Bureau and the State Scientific Research Institute of Aircraft Systems. Being approved by a collegium of Ministry of the Aircraft Industry they were passed to the plant #455. Under decree #100 of March 12, 1996 of Ministry of the Aircraft Industry the Experimental & Design Bureau, headed by Yurii N. Korolyov, was founded at the enterprise to draw up design documentation of Kh-66 missile. The flight working out was carried out between 1967 and 1968 and under decree #0075 of June 20, 1968 of Ministry of Defense the missile was put into service. During tests, the Experimental & Design Bureau started developing new "air-to-surface» missile Kh-23, which had been ready for the light tests by the end of 1967. In early 1970s, there was a need in updated guided tactical weaponry. In this context, in 1971 the specialists of the Experimental & Design Bureau developed a principally new guidance system of airborne "air-to-surface" missiles by means of a laser ray. The latter was guided onto the ground target, which served as an orienting point for a seeker. The ray was produced by a laser system generator, installed on Su-17M-2, Su-17M-3, MiG-27 planes. The new missile with a laser seeker was named Kh-25 and was attributed to the promising directions of missile manufacturing. Its state flying tests were carried out on November 24, 1974, and in 1975 the missile was serially produced. The works on expansion of guided missiles operational features were accomplished in several directions. 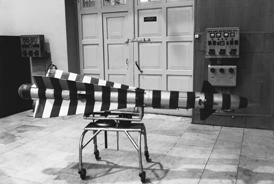 In 1972 engineers of the Experimental & Design Bureau began developing anti-radar missile Kh-27, equipped with a passive radar seeker, where the latter was capable to take target bearing, i.e. various types of hostile radars. By 1975 the missile and specially designed for it autopilot SUR-73 had been completed and on August 8, 1975 the state flying tests of the Kh-27 on MiG-27 plane started. In 1973 Victor N. Bugaiskii, Doctor of Technical Sciences, who had a good experience in aircraft- and missile equipment development, was appointed head engineer of the Experimental & Design Bureau. Under his leadership the designs of Kh-66, Kh-23 and Kh-25 missile were analyzed, that led to development of a concept of aircraft guided missiles' modular designing. In 1973 the works on forming rational module system started.